WRAPUP: The sunny weather held out just long enough to last the morning drive. A group of 9 MINIs headed down Sheridan Road and Lake Shore drive to meet up with another 10 MINIs at the official starting location. A fun drive through some nice urban roads.. A few groups of MINIs got a bit lost, crossed paths a few times and eventually joined together and found the right way to the end. Several people stayed for breakfast and visting afterwards!! As usual, send links of photos to steve@chicagominiclub.com and I will put them here to share. Head on out for an early morning drive to explore some fun roads south of downtown and South Lake Shore Drive area. Optional Breakfast: After our drive, stay for a bite at Valois Restaurant near the finish at 1518 E 53rd St. Please leave a comment letting us know you will have food, so we can make plans. What to Bring: A bunch of quarters for parking at the end destination, Camera, FRS Radio (tuned to Channel 1, Subchannel 1), your favorite MINI Clothing, and a smile. Add a comment if you are planning to attend. Hope to see you there!! I am so in!!! Wife will be with! If enough northsiders are interested, we could do a meetup at the parking garage at the south end of the Nortwestern the campus, and cruise Sheridan and Lake Shore Drive. We would need to leave a touch after 7am.. If I go, I’ll be starting off from my parents’ place–so I’ll see you all at the Jewel’s. Lori and i will be there! Who is meeting at Northwestern? Anyone? Adam if you are in, I’ll be there!!! I am staying for b-fast at the end of the drive. 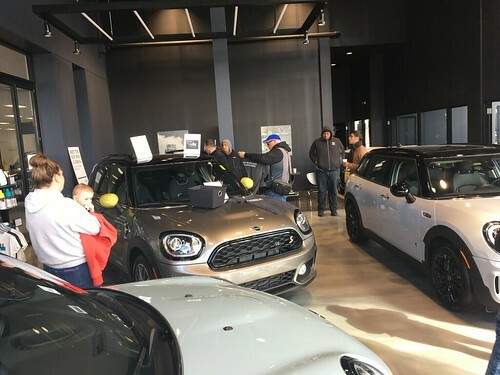 We are now up to a crowd of 3 MINIs for the optional pre-cruise, and we will leave the top floor of the Parking Garage at the south end of the Northwestern campus a touch after 7am. Just a casual cruise down Sheridan road and Lake Shore Drive. If I can figure out how to get there and we have time perhaps a quick scoot down Lower Wacker Drive before the official meetup. I will be attending and will join the group starting from Evanston. I am up for the Lower Wacker Drive side trip. I will also stick around for breakfast at Valois. My wife and I will be there….breakfast too. I’m hoping to be there… I’ll be racing out at sycamore speedway on Saturday night, we’ll see how soon I can get home and swap cars!!! 8am is really early when you get roll in at 4am…. I will hang around for breakfast as well. Mmm…breakfast. I’ll be there. I will meet everyone at 8 am at “the Jewels”. I’ll be there sunday plus one. And I’m in for the meet up at Northwestern. Hey all! Im in, but just a warning i take north LSD and Sheridan alot, and the left lane on sheridan is shot, also the 2 left lanes on LSD going south from hollywood are in horrible condition even since they tried to fix the potholes. Can wait to see everyone! I’m in for this one and some breakfast too. Count me in! Valois has great biscuits. Parking will be very intesting. There is a parking lot that is north of the resturant. The entrance is off of Lake Park St. This is a metered. So bring some quarters. I am going to try to make it to this event if I can get the classic go cart out of storage and change all the filters and fluids prior to Sunday morning. It will be fun to run around with all you big cars!! I will have membership form and check in hand to be official. My wife and I should be there, for the breakfast as well. Looking forward to our second MINI Drive! I will be there tomorrow for sure. Plan on me for breakfast at Valois. I will not be meeting the others up at NW, but if I’m up early enough and inspired, I may be hiding on Lower Wacker and fall in line when you all pass by. BTW-Adam, Lower Wacker has been known to have a few potholes, but I haven’t been down there for quite some time. Hopefully they’ve improved the road surface. As Mr Rich points out, the lot at the end of our route is indeed metered. It is a central meter and accepts both quarters and credit cards. Thanks for doing the route Chris!! I had a great time. Nice to meet all the new (and newer) people as well as old friends. I made it home 5 minutes before it started pouring, so great timing on the weather. Had a good time again. Thanks to Chris/Lori as well for the route. Sorry I couldn’t stay afterwards to meet and greet… duty called. Hope everyone had a good time. One of these times, I’m going to get a group shot so I can put the names to the faces. Fun drive! Breakfast was awesome as well. It was good to see everyone again… a great time was had by me. Thanks Chris & Lori for all the planning! Hope to see some of you guys on the 4th! I joined the same day. Cheers! We might be able to swing it – what a great event planned!